In all honesty, I thought I’d posted this recipe months ago, just after my favorite Indian cookbook author released her latest treasure, Quick Fix Indian, back in May. But a quick search through the archives proved me wrong. I guess this is a case of better late than never. Now if you’ve been reading along for awhile you know that I think Ruta Kahate’s first book, 5 Spices, 50 Dishes: Simple Indian Recipes Using Five Common Spices, is absolutely brilliant (and the good folks over at Amazon all agree as well). I often peruse other Indian cookbooks to expand my horizons, but rarely actually cook anything from them. Even the simplest recipes usually call for 2-3 exotic ingredients that I’ve never even heard of. By contrast, I’ve probably cooked at least 30-35 dishes from 5 Spices, 50 Dishes and have yet to find a recipe that’s overly difficult or a dud. And since I’ll soon exhaust all of recipes from her first cookbook, I’m thrilled to add 125 new dishes to my Indian food agenda. Even better? The dishes are all ready in 30 minutes or less. 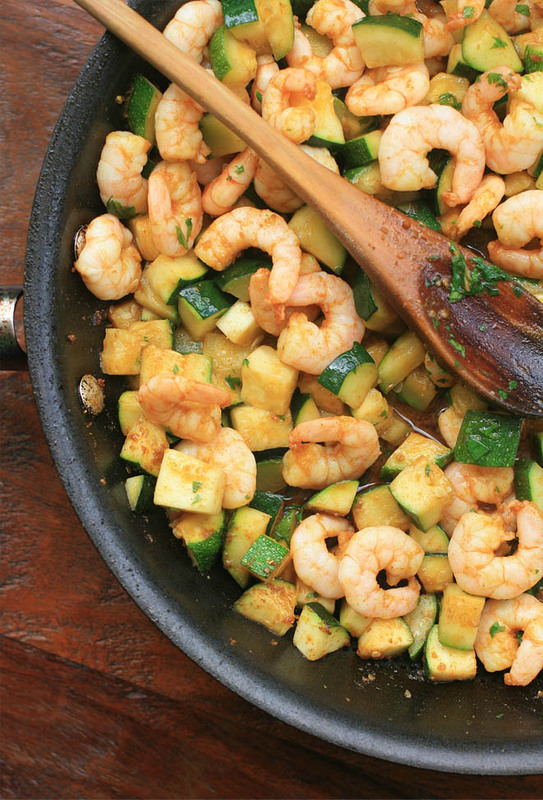 This shrimp and zucchini dish actually took even less time than that since I had some frozen peeled and deveined shrimp on hand. 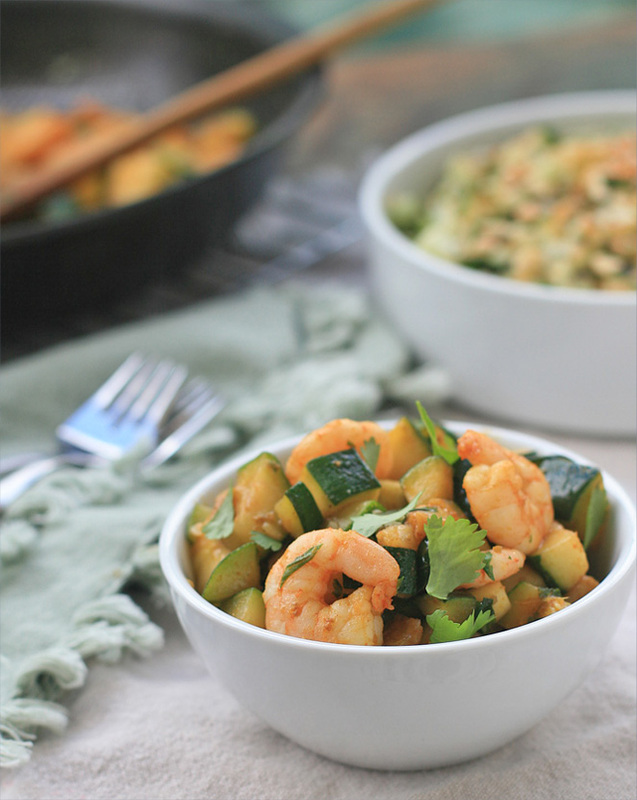 If you’re in need of a quick and healthy meal, definitely give this dish, full of plump shrimp, juicy zucchini and Indian spices a try. In a medium bowl toss the shrimp with 1/2 teaspoon of the turmeric and a pinch of salt. Set aside. Heat 2 Tablespoons of the oil in a large skillet or saute pan over high heat. Add the shrimp and cook, stirring constantly, until the shrimp is cooked through. Immediately remove from heat and, using a slotted spoon, remove the shrimp to a plate. Add the remaining Tablespoon of oil and reduce the heat to medium-high. Add the remaining turmeric as well as the bay leaf, cayenne pepper, cumin, coriander, and ginger. Cook, stirring frequently, until very fragrant, about 1-2 minutes. Add the zucchini and toss to coat. 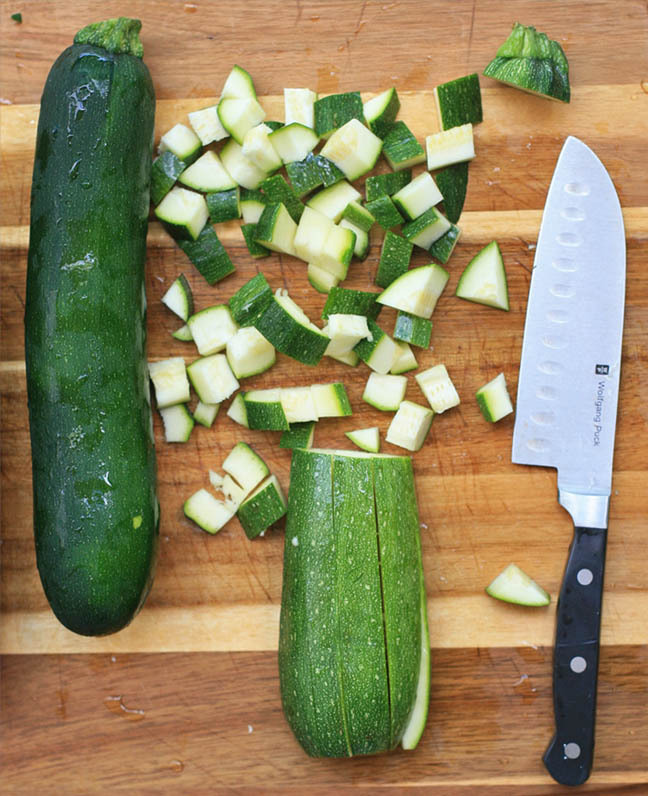 Cook, stirring occasionally, until the zucchini has softened and is slightly browned. Add the shrimp back into the pan as well as the cilantro. Toss well and remove from heat.